My mom got me a Tile Mate for Christmas and I love it! 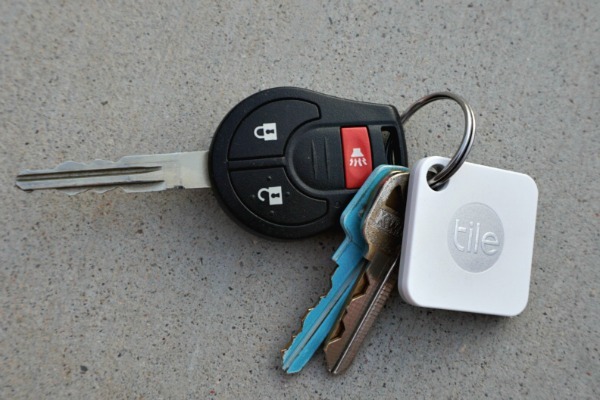 If you’ve never heard of it before, it’s a small device that helps you find your keys, phone, wallet, etc. I always forget where I set down my phone, so it’s perfect for me. You just double tap the gray button and it’ll ring…even if it’s on vibrate! I always keep my keys in the same spot, so I keep mine on my key ring, but it could be kept anywhere. It’s seriously SO handy! *This post contains some affiliate links. I receive a small percentage of the purchase price at no additional cost to you. 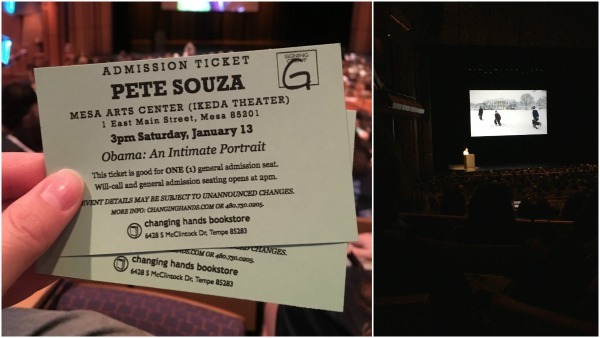 Last Saturday Adam and I went to see Pete Souza speak at the Mesa Arts Center. Pete Souza was the Chief Official White House Photographer for President Obama. He was also a White House photographer for President Reagan (you’ve probably seen his picture of Princess Diana dancing with John Travolta or this one of the Reagans with Michael Jackson). Anyway, he recently published a book of pictures he took during Obama’s presidency and now he’s doing a book tour. His Instagram account is one of my favorites, so when I saw that he was coming to Phoenix I had to buy tickets. The presentation was full of pictures and Pete shared the stories behind them. I laughed, I cried (when he was discussing Sandy Hook), and left feeling totally inspired. Adam and I both agreed it was an amazing afternoon. When we were at my parents’ house over Christmas we noticed that Jelly was obsessed with their dog beds. She camped out on the one in the living room for most of our stay. So of course we had to buy her a dog bed as soon as we got home. We checked PetsMart, but didn’t love any of the options. My mom said she thought she bought on of hers at Costco so we checked there and found the perfect bed. It’s large, has bolsters on two sides, and was only $42! Similar beds were WAY more at PetsMart. 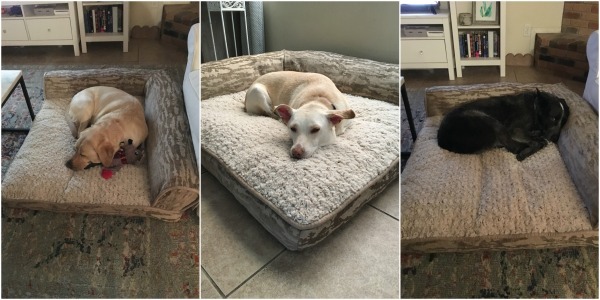 Of course once we bought the one bed, Ringo and Abby decided they also like sleeping on dog beds…despite the fact that they never used the one we used to have. SO, we bought a second one during our next Costco trip. They still prefer the couch and our bed, so I don’t think we need a third one. They seem to just switch off sleeping in different places. Anyway, this is just my PSA that Costco has amazing dog beds and they are reasonably priced. Adam and I saw I, Tonya over the holiday break and both really liked it. 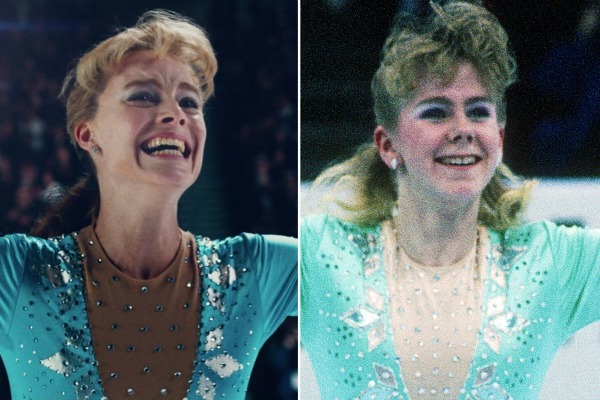 We ended up going on a Tonya Harding binge and watched the 30 for 30 episode “The Price of Gold” that same night. Tonya Harding’s story is SUPER interesting (and crazy) so both were a really good watch. The movie made her into more of a sympathetic character, but the 30 for 30 really reminded you that Nancy Kerrigan was the victim in the whole story. I have very conflicting emotions regarding how I feel about Tonya Harding and her story. On one hand, it’s hard not to be sympathetic about her childhood, abusive marriage and the fact the skating community discriminated against her for being poor, white-trash. On the other hand, she was her own worst enemy and wasted so many opportunities. Props for being authentic, BUT if you know your choice of music and blue nail polish is losing you points from the judges…I feel like those are easy changes to make for the sake of your career. I understand not having money for the expensive outfits, but those other changes are free. From the movie and the 30 for 30 special, it also sounds like she showed up for both Olympics out of shape and unprepared (partying instead of training). I also find it really hard to believe that she knew nothing about the planned attack on Nancy Kerrigan. Maybe she didn’t know the exact details, but she definitely knew something was going on. BUT, she did get banned from skating for life and has had to live the past 20 years in the shadow of her crazy ex-husband's deed, so it probably is time to give her a break and move on. I finished my first book of 2018! One of my goals for the year is to read more (18 books specifically), so I’m happy to report that I’m still on track for at least one of my goals. 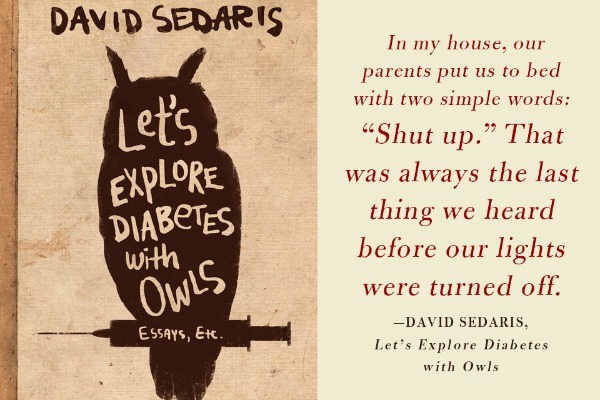 I finished Let’s Explore Diabetes with Owls by David Sedaris last night and I really enjoyed it. We saw him during his book tour in November (it was amazing and hilarious), so Adam got me this book for Christmas. Before I read this I would have said that I’m not a big fan of books of short stories, but I actually really enjoyed being able to finish a single story (or more) in one sitting. I didn’t have to think back about what happened in previous chapters. His books are probably not for everyone, but I really enjoyed it and a couple of the stories had me laughing out loud. What do you all have planned this weekend? My friend Michelle and I are having our monthly craft night on Saturday. We’re making wood letter blocks like this. Our subdivision is also hosting their big neighborhood garage sale this weekend, so I might check that out Saturday morning. I've never heard of the Tile Mate before either, but I could have definitely used it the other day. I misplaced my wallet, but thankfully I found it soon after. But using the Tile Mate would have surely saved some unnecessary stress. Also, thank you for sharing about Costco's dog beds. We are actually in the process of getting a new bed for our pup, and we want a one that's large but not too expensive! If you're looking for large and not too expensive, you should definitely check out Costco! The picture on the left is our lab and you can see how much room is still left with her on there. How I've never heard of the Tile Mate? I literately spend few hours a week searching for my keys and phone. You need to get one! It's saved me so much time and stress! I would love to have a Tile Mate! it would really come in handy for all the forgetful moments I seem to have as of late! Will check it out for sure! My dogs would LOVE that bed! Need to get it! They would! Ringo and Abby were never into dog beds until we bought that one. My husband and I went to hear Pete Souza talk when he was here and I agree! He was so interesting and the Sandy Hook part was very moving! Yay another Pete Souza fan! I love him! You should definitely get one! It's seriously so handy! I too am super conflicted on my stance with Tonya Harding... I have been wanting to see the movie! Also that book sounds like something I could accomplish! Ive been wanting to read more but with the three kids I never find the time! Short stories for one sitting sounds so manageable! I've always thought that I wouldn't be into short stories, but I actually loved it. It's satisfying to be able to finish a story in one sitting. I can't wait to watch I, Tonya! It didn't interest me at first, but I've heard really good things about it! You definitely need to see the movie! It's so good and SO interesting! I want to see I, Tonya so bad and I also really want to check out those Tile's. They were everywhere over the holidays, checking them out for sure now! I must live in a cave because I had never heard of them or seen them before my mom got me that one. Now I'm obsessed! We have Tiles too. I thought it was such a great idea that we got some for my parents too! It's funny how easily one can lose their keys!!! I need to get a couple for my boyfriend. He's always looking for his keys and wallet!